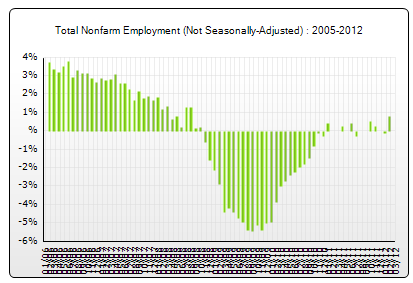 The current estimate for non-farm employment as of April 2012 is for 204,200 jobs. As you can see in this chart and data table from the State’s Employment Security Department, this is the lowest number of non-farm jobs since the recession started for April. Stated another way, Spokane remains stuck in a down sliding economy four years after the recession began and 3 years after the recession ended at the national level. Read the April line from left to right, and then add the latest number: 204,200. The inability of the Spokane area to create new jobs is shown graphically in this chart of percentage year over year job changes, from 2005 to 2012. As you can see, job growth began falling as far back as 2005. Now that the recession has officially ended at the national level, close to zero new job positions have been created in the Spokane region. Health care employment, when broken out separately, also continued to slide since last year. The health care category has declined from 34,100 last year to 32,800 this year, or a decline of 3.8%. Spokane leaders have proclaimed Spokane’s future to be centered on regional health care delivery. This is not a valid survey but I scanned the Craigslist ads on Memorial Day and there are quite a few more job openings across a wide variety of fields. This is very encouraging – I have not seen this growth in Craigslist job openings in several years.